It is the most wonderful time of the year! Since December is around the corner and the holiday season is upon us, I’d like to kick off the first of several holiday gift guides here on Stylebeat. Starting with all things cozy, here are some fantastic gifts to give and to get. I’ve discovered some goodies to warm the soul, and you can get your holiday shopping started. When you want to wear stripes all year long but can’t winterize your favorite striped Tee, Kule has you covered with their irreverent preppy take on the classics. 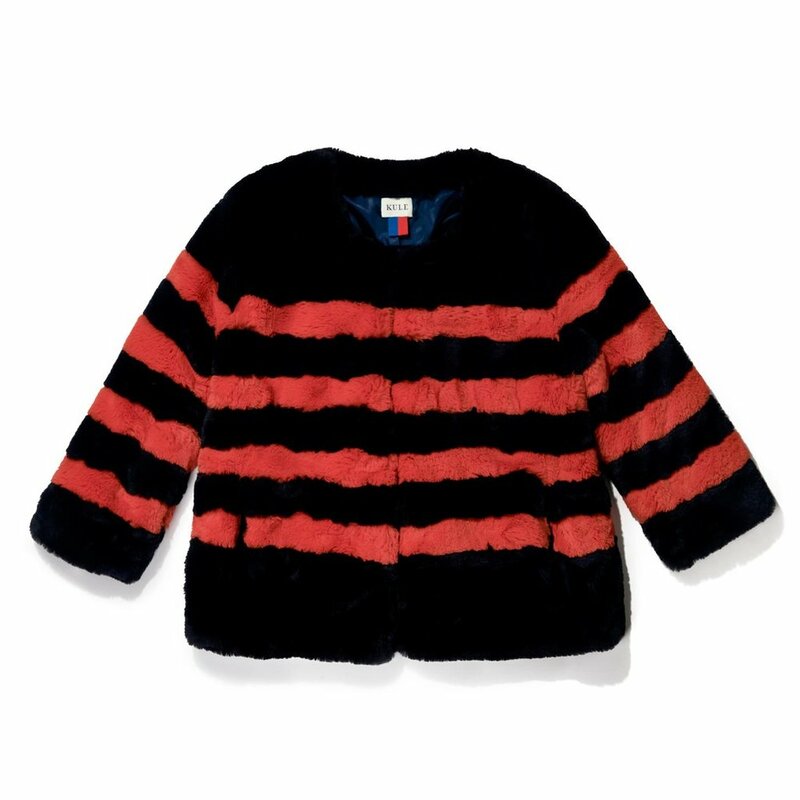 The Bailey faux fur striped coat will keep you warm when the temp drops. Warm feet are a must when things get cold, especially if you want to look at holiday windows. 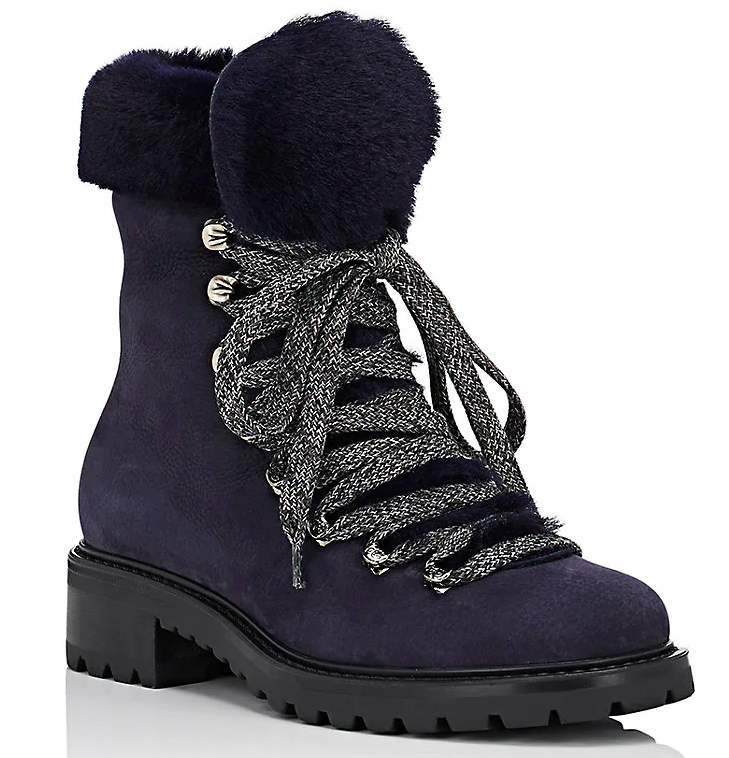 Barney’s New York has a classic hiking boot with luxe shearling lining. Navy keeps it interesting. I like to get a new hat every season. Eugenia Kim has a way with them, and she is my usual go-to. Then I saw this fantastic Q-Tip of a hat from Yestadt Millinery called Le Fluff. Cozy outside, organized inside. Mansur Gavriel’s beloved mini bucket bag now comes in millennial pink shearing! The Arrivals. Truth be told, I am obsessed with every move this young brand makes. They’ve established a name for themselves in street smart outerwear for the concrete jungle with a white hot cool factor. Everything from their web design to their styling is hipper than thou. If there is one thing to buy it is the Halstrom IV 3 in 1 Parka. Or, you can walk away with these bear mittens in the (weird) brown color everyone from H and M to Mansur Gavriel is doing faux and real shearling in this year. These are real, and they are warm, especially when wrapped around a cup of hot cocoa. Creepy or cool? Yes I am showing another piece from Kule, because I am questioning if the bank robber look is worth it when it is arctic out. If you like a balaclava, and want to channel OO7, then go for The Moritz. 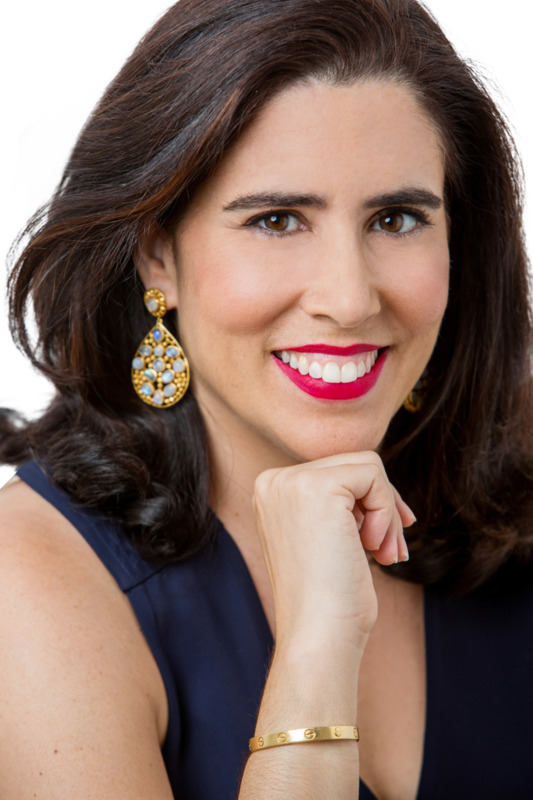 The San Francisco-based shoe startup, Birdies, are slippers that masquerade as shoes. Nothing wrong with that! They introduced a new smoking slipper style I really like, the Starling, and they are velvet bedazzled with a celestial motif. 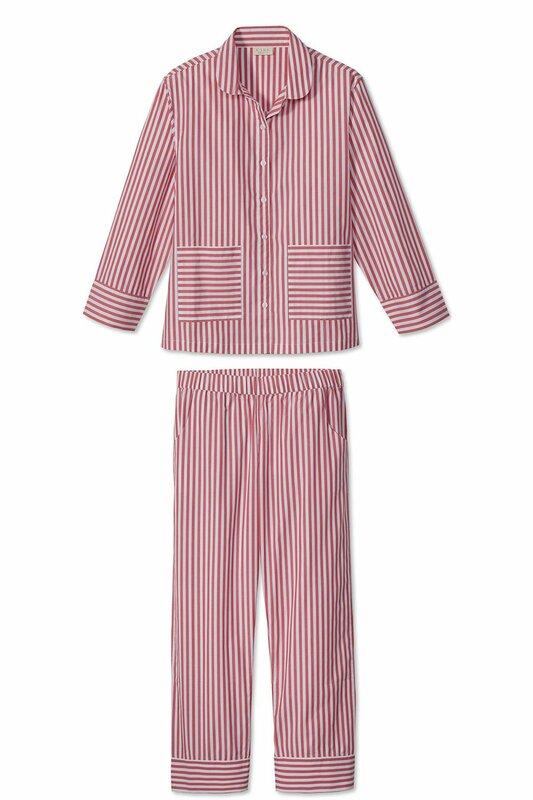 A favorite PJ company, LAKE Pajamas out of Charleston (stay tuned for their King Street shop coming soon) recently debuted these candy striped cotton classic red and white pajamas in classic shirting cotton. The pockets and cuffs have the stripes going horizontally- such a kicky cute detail. I’ll take a dozen. A cashmere robe. Need I say more? 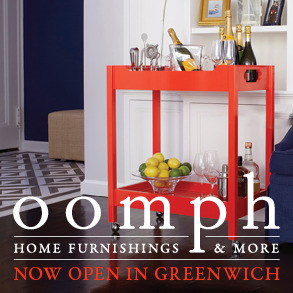 This one from Williams Sonoma Home is available with a monogram. You may have noticed: the quilt is back. Long beloved by interior designers for its neat look, the quilted bedspread has returned. 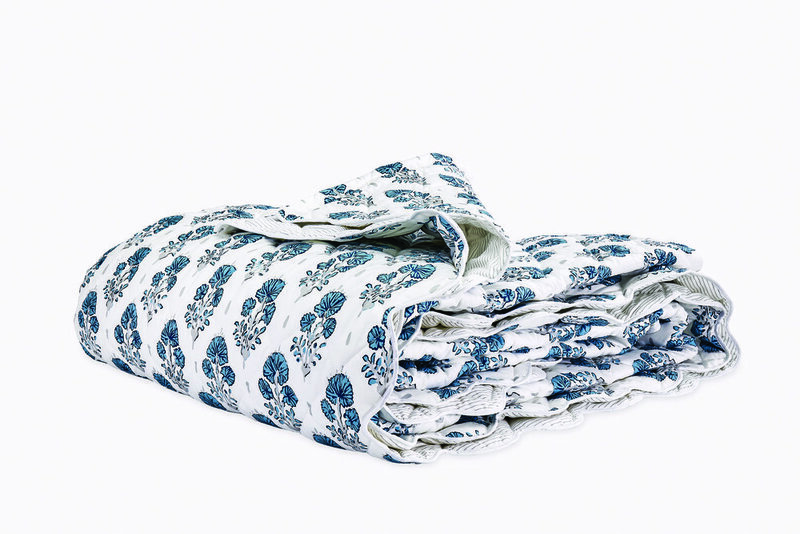 The tailored and scalloped Joplin Quilt by Lulu DK for Matouk features a fresh Indian inspired print in the freshest shade of blue with a hint of silver shimmer. Hands down, one of the chicest trays for breakfast in bed I have ever seen. New York-based interior designer Jeffrey Bilhuber designed a collection for The Lacquer Company, and it includes this lacquered Breakfast Tray Table with a removable tray on top. Very Billy Baldwin in its tailored chic style. Yeah, daylight savings got to you too? The answer is easy: it’s staying in season. Hill House Home gets this. Their embroidered baby pillow cases are customizable with the message of your choosing. 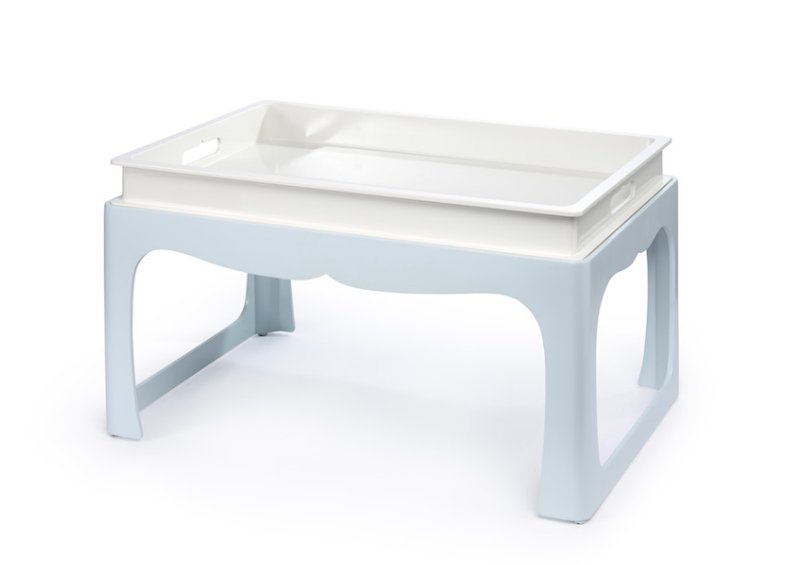 Oh and its take-a-tub season. Scrub a dub with Ouai’s Scalp and Body Scrub. 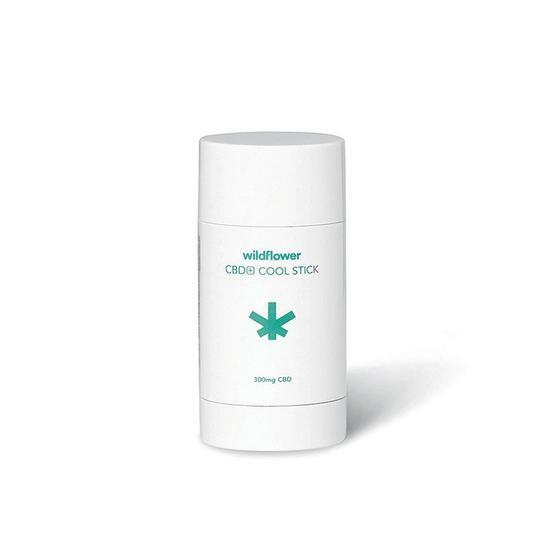 Cozy involves feeling good, so if you’ve pulled a muscle and want to quell the pain that won’t quit, Wildflower’s Cool Stick will come to the rescue with a menthol-infused remedy.